JCA NY Presents Rahul Kapoor Jain on Living in Harmony - A Jain Approach! 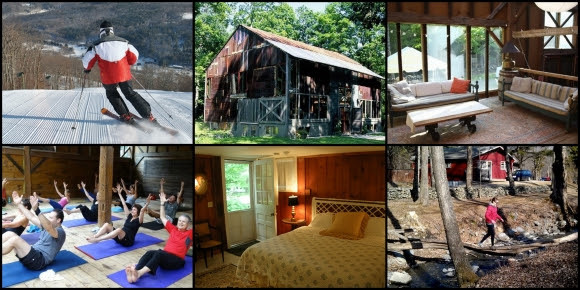 JCA NY 2018 Paryushan & Das Lakshana Maha Parv - Newsletter! The Nakro for daily Angi during Paryushan Mahaparva is USD 71/- Nakro for Angi for Mahavir Jayanti (Day 5) and the Samvatsari Day is USD 151/-. During Paryushan Mahaparva, for sponsoring Prabhavana at any religious day, morning or evening, please contact executive committee members and Temple Office. Nakro for each Prabhavana is $71/- for every day and $151/- for Mahavir Janam Day (Day 5) and Kshamapana Day. JCA is carrying out Ekasana during Paryushan starting from Thursday, Sep 10th to Wednesday Sep 16th, 2015. No Ekasana on Samvatsari day – Thursday, September 17th, 2015 and Friday, September 18th 2015 . We request all Sadharmik Brothers & Sisters to take Laabh of Ekasana Tapasya on 4th FL Bhojanshala, so please provide your name to the JCA Office at least a day in advance so, we can prepare the food accordingly and serve you better. Regular Bhojanshala at JCA will be closed during PAYURSHAN. He comes from Walkeshwar, Mumbai. He has had his Dharmik education for 6 years of complete course at Mehsana Pathsala. 5 Pratikaman, 9 Smaran, 4 Prakran, 3 Bhashya, 6 Karmagranth, Panchsangrah, Kshetra Samas, BrihadSanrahani, Tatwarth with Arth. He has experience of 30 Years of teaching as Dharmik teacher, 11 Years at Babu Amichand Panama Adeshwar Jain Temple, Walkeshwar, Mumbai and 9 Years at Shripal Nagar Jain Temple, Walkeshwar, Mumbai. Number of students studying at present - 400. Book written by Pravinbhai - Sutrarthsar Aatma Uddhar (2 Pratikaman Arth). Pravinbhai has done Payurshan Aradhana done at various places including Japan, Singapore, Houston (USA), Dubai, Bangkok (Thailand), New York (USA) & Israel. During Payurshan from Aug. 22nd to Aug. 28th, 2014 - Bhojanshala is available ONLY for people observing Ekasana. JCA is carrying out Ekasana during Paryushan starting from Friday, Aug 22nd to Thursday Aug 28th, 2014. No Ekasana on Samvatsari day – Friday, August 29th, 2014. We request all Sadharmik Brothers & Sisters to take Laabh of Ekasana Tapasya on 4th FL Bhojanshala, so please provide your name to the JCA Office at least a day in advance so, we can prepare the food accordingly and serve you better. Nakro for Sponsoring Ekasana is Min. $501/-. Your generous donation will be highly appreciated and it will be announced in the Sangh. Saturday, August 30th, 2014 at JCA Itahaca Temple, 4th Fl., starting at 7:30 AM. MEMBERS WHO ARE INTERESTED IN SPONSORING PARNA FOR 2014 & 2015 SHOULD GIVE THEIR NAMES TO THE EXECUTIVE COMMITTEE MEMBERS AND JCA OFFICE. NAKRO FOR SPONSORING PARNA FOR 2014 & 2015 IS $1,501/- PER SPONSOR. Ayambil Oli starts from Tuesday, September 30th, 2014 & ends on Wednesday, October 8th, 2014. Parna for Ayambil Oli is on Thursday, October 9th, 2014 at JCA Bhojansala 4Fl @ 8:30 AM. SPONSORS: Jyotsanaben Hasmukhbhai Shah | Purviben Manishbhai Sanghavi. MEMBERS WHO ARE INTERESTED IN SPONSORING THE EVENT, SHOULD GIVE THEIR NAMES TO THE EXECUTIVE COMMITTEE MEMBERS. During this Mahaparva, we will be having discourses on Das Dharm , Karm Siddhant & Principle of Jain Dharma to enrich our understanding & practice of important Jain Principles. DAILY PAATHSHALA CLASSES in English. You are encouraged to come to the temple everyday during this spiritual and educational Maha Parva to maintain our great Jain heritage for yourself and your children. Those who wish to participate in the Pooja & Vidhan’s must bring their Shudh Dhoti Dhupta, Keshari Sari’s and Mala & Mukut. Ayambil Oli starts from Monday, October 19th, 2015 & ends on Tuesday, October 17th, 2015. Parna for Ayambil Oli is on Wednesday, October 18th, 2015 at JCA Bhojansala 4Fl @ 8:30 AM. Detail information about Chaitya Paripati will be announced as soon as we finalize the details. Form will be send thru email and will be kept in JCA Temple. We will be leaving for Detroit on Saturday, Oct 10th 2015 and returning on Monday, Oct 12th 2015. Professionally working as a Family Physician for last 30 years Dr. Abhay Dagade has studied many ancient Granthas such as: the Chhaha Dhala, Tatwarth Sutra, Ratna Karandak Shravakachar, Samaysar, etc. He has been arranging and conducting Swadhyaya classes twice a day in Shri Parshwanath Digambar Jain Mandir in Kopargaon. He worked as the chief of Digambar Jain Samaj in Kopargaon from 1999-2001. He helped with the construction of Bhagwan Chandraprabhu Chaityalaya. He arranged and conducted the Panchkalyanak Pratishtha Mahotsav there as well. He has given lectures on various topics in many different cities. During this Mahaparva, we will be having discourses on Prashnottatar Ratnamalika by Raj Rishi Amoghvarsh Muni along with virtues of Das Dharm, Karm Siddhant & Principle of Jain Dharma to enrich our understanding & practice of important Jain Principles. FRIDAY, SEPTEMBER 11TH THRU FRIDAY, SEPTEMBER 18TH 2015. Please consult JCA newsletter for further information. PLACE: JCA TEMPLE, 2ND FLOOR, STHANAK. Grand Central Pkwy (or Norther Pkwy): Take Exit-28 (Willis Ave.) and drive towards South. AUGUST 22ND THRU 29TH 2014. PLACE: KNIGHTS OF COLUMBUS (New Hyde Park), 1000 Marcus Avenue, NHP, NY 11040. FROM LIE (495) – Take Exit 34 (New Hyde Park Road) and go towards South – Turn left on Marcus Avenue. FROM GRAND CENTRAL PARKWAY – Take Exit-26 S (New Hyde Park Rd) & go towards South – Turn left on Marcus Ave.
Saturday, Sept. 05 Pujyashri Brahmchariji's Birthday (Janmastmi). Sept. 10 to Sept.18 Shri Paryushan Maha Parva. Wednesday, Oct. 28 Shri Atmasiddhi Rachna Din & PP Prabhushriji's Janma Divas. Nov. 09 to Nov. 12 Shri Deepavali Aradhana (36 Mala daily for Samadhi Maran as per Kram). Wednesday, Nov. 25 Param Krupalu Dev's Janma Jayanti (Kartiki Purnima). August 17 Celebrating the 125th Birth Anniversary of Pujyashri Brahmacharji. Gunanuvad Bhakti & Satsang Swadhyay. September 21 Swadhyay on Shri Vachnamrutji. November 9 Celebrating the 147th Birth Anniversary of Param Krupaludev Shrimad Rajchandra. Special Bhakti & Swadhyay. December 14 Swadhyay on Shri Vachnamrutji. Shri Paryushan Aradhana Days - August 22 to August 29, 2014. Shri Atmasiddhi Shastra Rachna & P.P. Shri Laghurajswami Birth Day- October 9, 2014. Shri Diwali Samadhi Maran Aradhana Days- October 21 to October 24, 2014. Shri Param Krupaludev’s Birth Anniversary Day - November 06, 2014 (Dev Diwali). Samvatsri Pratikraman - Mandir Tradition 4 FL. 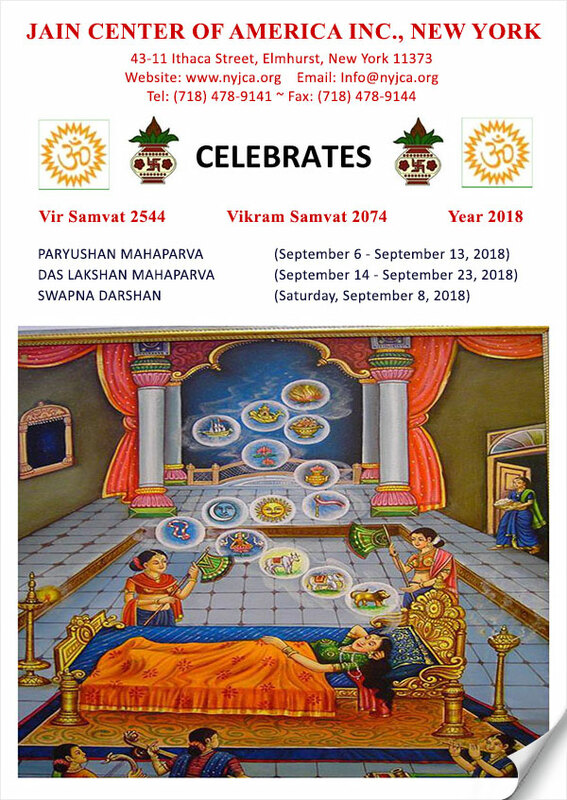 Samvatsri Pratikraman - Sthanak Tradition 2 FL. All programs are scheduled to be held at Ithaca Street Temple. Swapana Darshan and Bhagawan’s Janam Celebration will be observed on September 13th. Please consult JCA’s news-letter for details. Dr. Jain is Professor of Sanskrit at Jai Narain Vyas University, Jodhpur. He also has stronghold in Prakrit language. His thrust area of interest is Jainism and Buddhism. He has done extensive research work on epistemology and logic in Jainism and Buddhism. He also takes active interest in other schools of Indian philosophy and sanskrit literature. He has served as the HoD, Sanskrit (2009-2012) and as founding director of Buddhist Studies Center, J N Vyas University (2006-2011). He is a chief editor of Jinvani- monthly Jaina Journal/magazine since October 1994. He also edited another bimonthly Jaina Journal - Swadhyay Shiksha (1988-2002). He has edited more than 25 books on Jainism and Buddhism. He has chaired sessions in various national and international seminars, symposia, workshops and conferences. Sadhvi Shri Rohiniji Maharaj sa. Samvatsri Pratikraman - Mandir Tradition 4th FL. Samvatsri Pratikraman - Sthanak Tradition 2nd FL. Swapana Darshan and Bhagawan’s Janam Celebration will be observed on Sunday, August 24th. Please consult JCA’s news-letter for details.